Goji Berries can produce fruit from a small size plant and can bear fruit once temperatures are consistently above 80 degrees. Goji Berries are considered among one of the super fruits. They are very high in antioxidants and good for brain health. 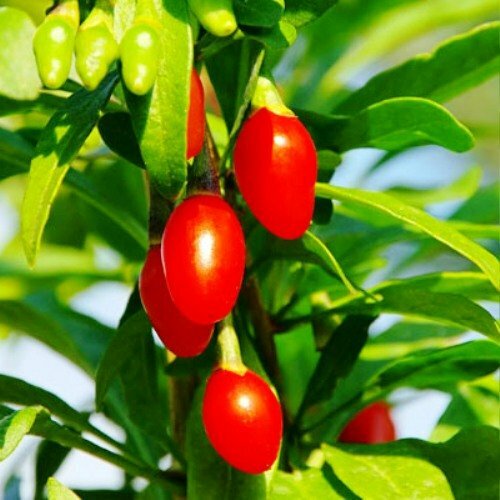 Goji Plants are native to China where it is cultivated for food as well as traditional medicines. The foliage is bright green, the flowers lavender, and the fruit is an orange-red color. Goji plants are very cold tolerant and can survive temperatures as low as -15 F. The leaves and roots are also high in nutrients for teas and cooking. Mature Goji plants have a good drought tolerance, however consistent watering will increase your fruit production. These plants are self-fertile with easy maintenance and grow 2-4 feet tall. The price includes Four (4) Goji Plants with USPS Shipping. These are 2 inch rooted starter plants shipped in 2 inch tray pots and are 4-6 inches tall. Goji Berries can produce fruit from a small size plant and can bear fruit once temperatures are consistently above 80 degrees. Goji Berries are considered among one of the super fruits. They are very high in antioxidants and good for brain health. Most all edible plants grow well in Full Sun but a little shade won't hurt. Goji Plants can be planted in most healthy soils in normal pH range. I recommend when you receive your plants to grow in a 4 inch to 1 gallon pot in a good organic potting soil like Fox Farm's Happy Frog.